I'm going now Derby's season is over. I bought tickets ages ago but didn't make any travel arrangements until I knew the team's fate. Anyone have any idea what time the sound check would be? The show doesn't start until 9pm so I'd rather bump in to Elvis before the gig than after. Im assuming a late sound check? Have a great night. I wonder if Elvis will speak in Italian. Also I'm betting he'll play All this useless beauty. Bologna, 26 maggio 2016 - Approda anche a Bologna il “Detour” di Elvis Costello, solo show che ha fatto il giro del mondo riscuotendo ovunque ampi consensi. Sabato 28 maggio il celebre musicista britannico, dallo stile unico e dal talento poliedrico, farà tappa al Teatro Auditorium Manzoni per traghettare il pubblico in un entusiasmante viaggio attraverso quarant’anni di musica. “Detour” significa deviazione, quindi allontanamento dai percorsi regolari e prevedibili. Se c’è un artista che incarna al meglio la presa di distanza dai normali tracciati e la rottura degli schemi, egli è senz’altro Elvis Costello, la cui lunga carriera musicale è stata tutta all’insegna della metamorfosi, della sperimentazione e dell’eclettismo. Spaziando con disinvoltura tra i generi più disparati, dal punk alla Deutsche Grammophon, dal crooning pop fino alla riscoperta delle radici folk americane, infatti, Costello ha sempre dato prova di una incredibile grinta e di una continua voglia di evolversi e di stupire, spesso con grande umorismo. Il concerto è inserito nell’ambito della stagione Manzoni Factory. Inizio ore 21.00, biglietti da € 50 a € 25 + d.p." Bologna, May 26, 2016 - The "Detour" by Elvis Costello, arrives in Bologna, the only show that has been around the world received very good reviews. On Saturday, May 28th the famous British musician with a unique style and versatile talent, will take the stage at the Teatro Auditorium Manzoni to ferry the audience on an exciting journey through four decades of music. "Detour" means deviation, then departure from the regular and predictable paths. If there is an artist who best embodies the distancing from the normal paths and breaking of the schemes, he is undoubtedly Elvis Costello, whose long musical career was all in the name of metamorphosis, of experimentation and of ' eclecticism". Ranging casually disparate genres, from punk to Deutsche Grammophon, the crooning pop up to the rediscovery of American folk roots, in fact, Costello has always shown an incredible determination and a constant desire to evolve and surprise, often with great humour. The concert is part of Manzoni Factory season. Starts at 21:00, tickets from € 50 to € 25 + d.p. " 23. Jimmie Standing In The Rain - including Brother, Can You Spare A Dime? 24. (What's So Funny 'Bout) Peace, Love And Understanding? EC on Allen Toussaint producing "Walking On Thin Ice": "He actually liked all of the Attractions, which was more than I did." I just came on line to post the set list from memory having just jotted it down over breakfast only to find I'd been beaten to it. Elvis' voice is back and he sounded great. Only one stumble where he appeared to cough during She. The stories were slightly abridged but basically as heard before. I picked out the comment about liking the Attractions, which made me smile. Not much of s language issue although it did seem from my vantage point, front row of the balcony, there was a low muttering going on during the spoken parts which I assumed was a bit of translation going on. Loved the Alison unplugged, which it literally was. He started playing in the normal way and then seemed spontaneously to walk away from the mic and throw out the plug from his guitar. The hall acoustics were spot on so it seemed little effort was needed. He sat in a spare seat in the front row at one point while singing. There was no section inside the tv but thoroughly enjoyable all the same. I thought Larkin Poe were joining him in Italy but obviously not. Some of those songs I would have liked to hear in Padova. While my ouverture of preference would have been Hurry Down Doomsday or Lipstick Vogue. After The Fall, another obscure choice from Mighty Like A Rose, as Invasion Hit Parade some evenings ago. Offshoreram wrote: I thought Larkin Poe were joining him in Italy but obviously not. They will be in Rome and Brescia. He sat in a spare seat in the front row at one point while singing. I seem to recall during the Delivery Man tour(s) he did this on a number of occasions as he wanted to "watch the band". Think it was for Almost Blue and probably stage managed, as the only free seat on the front row was conveniently smack bang in the middle. Due ore di canzoni pressochè senza soste, quasi una decina di chitarre imbracciate sul palco, un pianoforte ("me l'ha prestato mia moglie", Diana Krall, ndr) e racconti autobiografici sullo sfondo di vecchie fotografie in bianco e nero, filmati vintage, manifesti anni Cinquanta e Sessanta. 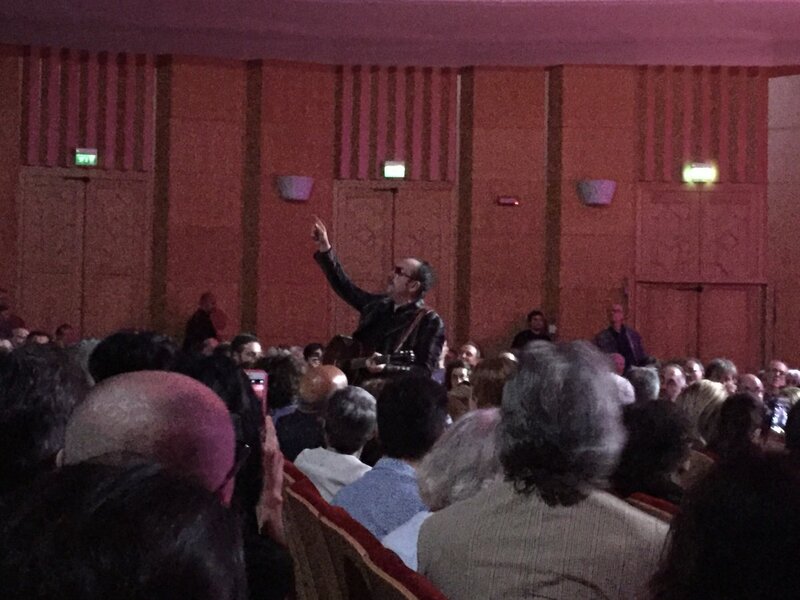 Con "Detour" Elvis Costello, 62 anni, sanato sera ha entusiasmato il pubblico del Teatro Manzoni di Bologna che l'ha ripagato con applausi incessanti e una doppia standing ovation nel finale. (Foto Roberto Serra/ Iguana Press)"
Two hours of almost non-stop songs, almost a dozen imbracciate guitars on stage, a piano ( "lent me my wife", Diana Krall, ed) and autobiographical backdrop of old photographs in black and white, vintage movies , posters fifties and sixties. With "Detour" Elvis Costello, 62, made whole night wowed the audience of the Teatro Manzoni in Bologna that has paid off with incessant applause and a standing ovation in the final double." Elvis Costello oltre alla sua musica ha portato sul palco del Teatro Manzoni un pianoforte, cinque chitarre e un sorprendente senso dello humor (in fondo è pur sempre inglese ndr), oltre a una scenografia d'altri tempi, fra l'enorme televisore vintage sul quale scorrono foto di famiglia, immagini degli anni Cinquanta e Sessanta (copertine di libri noir e polizieschi, locandine di B-Movie...) e oggetti di scena come megafoni, insegne luminose, lampade e sedie. Il suo volto è nascosto da grandi occhiali neri, che dopo un po' sostituisce con degli occhiali da vista. Il 'racconto' è quello della sua vita e dei suoi 40 anni di carriera: ricordi di infanzia, aneddoti sulla sua famiglia documentati dalle foto proiettate dal televisorone, tante battute sulle donne, mentre non ha risparmiato neppure Donald Trump. E poi ci sono le sue canzoni: “Brilliant mistake”, “Shipbuilding”, “Beyond Belief”, “Almost Blue”, “Everyday I write the book” e, non poteva mancare, "She", pezzo di Charles Aznavour rivisitato da Costello per la colonna sonora di "Notting Hill". "Elvis Costello" è lo pseudonimo di Declan Patrick MacManus ed è un omaggio al grande Elvis Presley e alla bisnonna Elizabeth Costello, che aveva evidentemente origini italiane. La nostra lingua però non l'ha mai imparata: al pubblico rivolge solo qualche parola in italiano, un saluto e poco più. Non importa: gli applausi arrivano fin fuori dal teatro e la standing ovation non gliela toglie nessuno. Dopo Bologna Costello sarà stasera Roma e il 31 maggio Brescia, dove chiuderà il suo "Detour" "
"He convinced everyone from the stage of Manzoni, which for the occasion has hosted a huge vintage TV on which have passed the first 40 years of Declan Patrick MacManus's career"
Elvis Costello in addition to his music took the stage at the Teatro Manzoni a piano, five guitars and an amazing sense of humor (at the bottom he is still English ed), as well as a scene of the past, among the huge vintage TV on which ran family photos, images of the Fifties and Sixties (covers of noir and detective books, B-Movie posters...) and props such as megaphones, neon signs, lamps and chairs. His face is hidden by large black glasses, that after a while he 'replaces with eyeglasses. The 'story' is that of his life and of his 40-year career: Childhood memories, anecdotes about his family documented by the pictures projected from the television, many jokes about women, and did not spare even Donald Trump. And then there are his songs: "Brilliant Mistake", "Shipbuilding", "Beyond Belief", "Almost Blue", "Everyday I write the book," and could not miss, "She", the Charles Aznavour song that Costello revisited for the soundtrack of "Notting Hill". "Elvis Costello" is the pseudonym of Declan Patrick MacManus and is a great tribute to Elvis Presley and the great-grandmother Elizabeth Costello, who had evidently Italian origins. Our language, however, has never learned: the public addressed only a few words in Italian, a greeting and a little more. No matter: the applause coming from out of the theatre and a standing ovation not nobody takes it from him. After Rome and Bologna Costello will tonight May 31 play Brescia, where "Detour" closes."